If you’re interested in bicycle touring in beautiful Scandinavia and exploring the deep water fjords of western Norway, you’ve come to the right place! I recently completed The Fjord Cycling Route Bike Tour offered by a Norwegian company called Berg Fritid. I enjoyed the bike tour so much, I’d like to take a moment right now and share with you all of the important details of the trip to get you encouraged and on your way. As you read through this article, you will find all the details of this self-guided bicycle tour; plus a summary of the Fjord Cycling Route Bike Tour along the Sognefjord; an overview of the hotels you will stay in throughout the tour; and of course, beautiful photos from along the route. Optional: This tour can be made longer by booking extra nights at any of the hotels along the route. With this self-guided cycling tour (arranged by Berg Fritid) you are in for a real treat! All you have to do is get to Norway for the start of the tour! The tour begins and ends in the small town of Matre, Norway. Matre is a 90 minute bus ride north from Bergen – the second largest city in Norway. Bergen is worth a visit for its many sightseeing and tourist activities and is easily reachable as it is home to an international airport. Consider staying in Bergen’s city center at least a night or two before the tour begins. The next day (the start of your tour) you can easily find the central bus station in downtown Bergen and take the 8:00 am or 12:30 pm bus (#430) into Matre. After arriving to Matre in the early afternoon on the first day of the tour, you will have time to visit the Bjorn West Museum where you will learn the history of how the area was affected during World War II. It is easy to see how nature has played a role in the history and development of this small town. Learning about Matre will get you excited about all that you will see in the few days of cycling ahead of you; most especially the nature you will see, feel and breath in on the bike. From Matre, you will cycle just 17 kilometers north-east until you reach your first hotel, the Stordalen Fjellstove. There is a steep uphill challenge during this first day of cycling, but the scenery is so captivating you’ll hardly feel the burn. 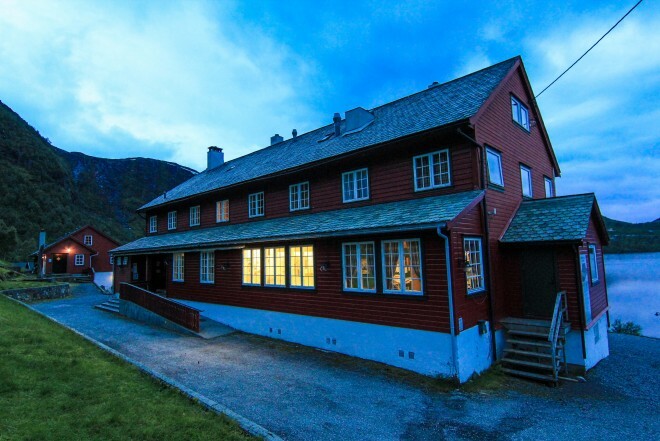 You may wish to add an extra night onto the tour here at the Stordalen Fjellstove to enjoy the lakefront hotel and surrounding area – especially the mountain biking (weather permitting). If you are interested in mountain biking, Berg Fritid, will provide you with mountain bikes at the hotel. I could have stayed any number of extra nights at this hotel (or really any of them along the way). I was especially taken by this lakefront hotel’s views, the cabin-like feel, the generous downstairs seating, great meals and friendly staff. Your second day of cycling (and longest at 66 km) will take you farther north to the waters of the Sognefjord – Norway’s longest and deepest fjord. Cycling along the edge of the road where the land meets the water was spectacular! Being on the bike will allow you to fully appreciate and take in the beauty of this truly unique area. You’ll eventually turn to the west, cycling along paved roads that follow the water of the Sognefjord, which offers gorgeous views of calm waters, green foliage, red cabins and snow-spotted mountains. It’s here that you have the option of stopping at the Massnes Wildlife Museum, which is a quirky collection of a local man’s passions for nature and animals, which you will see in the numerous taxidermy displays. It is well worth a visit as you will learn about the many animals of the area and likely be enamored with the owner. Plus, it offers a break from the bike before reaching the hotel Brekkestranda. The Brekkestranda (your hotel for the night) is an architectural beauty with dark wood walls, a grass roof, plenty of windows and not a single right angle. The view of the Sognefjord from the hotel is forever imprinted in my mind and will undoubtedly make an impression on you as well. We enjoyed a three-course dinner there and woke up with a plentiful breakfast buffet. The third day of cycling is a 46 kilometer bike ride that will take you to the most western part of the Sognefjord, then south into the small historic town of Eivindvik. This was my favorite day of the bike tour as we encountered a long downhill the delivered us to a path right near the water. Being on the bike on that kind of a road was such an adrenaline rush. All of my senses were engaged, including smell when the salty air blasted us right before we reached the bottom. I remember a tough hill toward the end of the day that took us passed the small town of Djnga, but I also remember waterfalls trickling down the sides of the mountain, just near our road. The Eivindvik fjord hotel is right on the water and and centrally located in the small town so you can easily explore, or relax on the balcony and just take in the views. At the Eivindvik Fjord Hotel, I was delighted by the hospitable staff and fresh brewed coffee in the afternoon when we arrived. I also enjoyed the fresh baked bread offered as one of the many options in the breakfast buffet. The fourth day of the Fhjord Cycling Route bike tour begins with a ferry ride to the city of Mjømna. There is a direct ferry (less than thirty minutes), or a longer one (just over an hour) that you can take to see many of the small islands around the western part of the country. From Mjømna, enjoy spectacular views as you cycle 32 kilometers over bridges connecting different islands and past the world’s second largest oil refinery. The last stretch follows along a river where you will find the Froyset Gardsmat – your charming farmhouse hotel. Once at the hotel, you can choose to regroup for a bit of dirt road trail riding in a nearby valley or perhaps a short local hike. Or if you prefer, you can simply sit and relax in this charming farmhouse. I personally couldn’t get enough of this farmhouse and would love to go back to spend more time there. The last day is a 42 kilometer ride that takes you mostly along a river and back into the tiny town of Matre where the tour began. You can choose to stop in the small town of Solheim before the last leg of the trip, but keep an eye on your time if you are headed back to Bergen. In which case you’ll need to allow time to return your bags, reorganize and catch the 16:50 bus. The last few hundred meters of your tour are a bumpy downhill on an old road that will take you straight back to the Bjorn West Museum. Being an active tourist provided such a sense of accomplishment, which was a great feeling to take home with me, along with the many wonderful memories. Click here to see more photos from my personal bicycle touring experience on the Fjord Cycling Route bike tour. I was charmed by every one of the hotels on the bike tour and I’m sure you will be too. Some language and cultural barriers should be expected when traveling in foreign countries; but every hotel staff member we met spoke English and was helpful, friendly and accommodating. Every hotel had free wi-fi and was able to cater to specific dietary preferences. The long kitchen counter is where you will find your room key when you check into this charming hotel with its beautiful red exterior. The location, situated on a small lake, is ideal as it offers beautiful views of lake water, snow-spotted hills, waterfalls and occasional sheep passing by. The dining room offers lots of seating, and adjoining sitting rooms are perfect for sitting back with a cup of tea or coffee. The rooms are charming with wood accents (we had wooden bunk beds!) flannel curtains and spotless white bathrooms. You’ll recognize this hotel while you’re still on the bike, riding towards it. Its roof is a grassy lawn – a bright green contrast to the hotel’s dark brown, wooden exterior. What really stands out is the architecture. The architect that designed the hotel had specifications that there wouldn’t be a single right angle in the hotel. Even some of the windows and doors that seem to have right angles are tilted by at least one degree. The number of windows is truly impressive – most of them a different shape. The windows offer plenty of natural light into the well-designed rooms and a gorgeous view outside of the waters of the Sognefjord. As you ride into the sweet, small town of Eivindvik, you’ll be hoping that your hotel is right in the center of town. You’ll be happy to find that it is, plus it’s right next to a supermarket and situated at the water’s edge. The interior is more modern than the other hotels on this bike tour; it feels like it was recently remodeled. We enjoyed the long balcony that overlooked the water. Homemade signs on poster board will help you find your way to this old farmhouse that has been converted into a hotel. Shortly after, you’ll meet the couple that owns the place and the husband’s mother who does all of the cooking. The farmhouse has only a few rooms to choose from – all of them furnished with antiques; the beds covered in handmade quilts. You’ll have access to the kitchen, newly refinished bathroom, laundry machine, and adorable sitting room. The surrounding area offers hiking, walking or more cycling if you so choose. You can make your trip longer by staying at any one of these charming hotels; but this one was my personal favorite. This self-guided bike tour in beautiful fjord Norway is ideal for those able to cycle for several hours a day and cover moderate distances. The entire tour is on paved roads, but there are plenty of uphill (and downhills) each day. If you are intimidated, keep in mind that a mid-morning start each day allows for plenty of breaks for taking in the scenery, eating, re-hydrating, or just resting! Additionally, you can request to add an extra night’s stay onto any of the hotels along the way to have a day off the bike. Also, keep in mind that you won’t be traveling with a guide, so cyclists will need to be confident in map-reading/navigating and repairing their bikes. This is a self-guided tour, meaning you will be provided the tools and materials to complete the trip on your own. The company is always available by phone but you will be expected to follow the map and directions and carry out any necessary repairs. 1. Eliminate the planning – your bikes, your route, your hotels and your meals are all arranged for you in advance by the tour company, Berg Fritid. 2. Choose your travel companion – This isn’t a group tour, so you decide who you would like to travel with. You can even travel alone if you like; Norway is a safe country with low crime rates. 3. Go at your own pace – No need to keep up with a large group. You have the map and the tools to get you through each day and you have plenty of time to enjoy each day, or if you prefer, to race along at your own pace. 4. Stay at a hotel each night – The hotels are arranged for you along with breakfast, lunch and dinner at each one – a lovely start and finish to a day of cycling. Your hotels, breakfast, lunch and dinner will be provided with the cost of the tour, but you’ll want to have some extra money on hand. The Norwegian currency is the Norwegian Krone. It is available for exchange at the Bergen airport and available to withdrawal at ATMs along your route. Debit and credit cards are widely accepted but I like to travel with at least a bit of local currency. Bus tickets – you will have to pay for your bus ride to and from Matre as well as any transportation the day before and after your tour. Ferry ride – The fare for the ferry ride on the fourth day of the trip is not included. It cost 95 Krone and can be paid for with cash or card. Snacks and drinks – All meals are included with the bike tour, but you might want to stop for snacks or drinks along the route. There are some supermarkets along the way and also a few small stores where you can stop for a rest and get something to drink. Hotel in Bergen – All hotel accommodation is included along the way, but it is recommended you stay in Bergen the night before the trip begins. Norway has so much to offer: history, hospitality, nature and scenery. I learned more on this trip than I had imagined and I got to enjoy the nature and scenery by being right in it on the bike. I was overwhelmed by the kindness of all the people we encountered along the way. I was pleasantly surprised by even the smallest things, like not having to lock our bikes and drinking fresh water out of the tap. I enjoyed the worry-free ease with which we could travel because Berg Fritid took care of all of the logistics for us. And I know you will enjoy many similar things while also creating your own unique experience when you follow The Fjord Cycling Route. This entry was posted in Bicycle Touring Pro Articles, Europe, Featured Articles, Guest Posts, Locations, Main Articles, Norway, Product & Service Reviews and tagged berg fritid, bike tour, bike tour review, cycling in norway, darren and katelyn, fjord bike tour, fjord cycling route bike tour, katelyn and darren, katelyn miller, norway, norway bike tour, sognefjord, sognefjord bicycle tour, sognefjord bike tour. Hi Katelyn (and Darren). I enjoyed reading this and also enjoyed keeping up with you (via Darren’s TouringPro Facebook page) while you were on the tour. I’m wondering if you would be willing to provide a bit more information about the actual bikes? My wife and I are considering this tour for next year and I’m curious as to the quality of the rentals. It’s hard to tell much from the pictures. Thanks! Good question Brian. The bikes we were given to use for the tour were a kind of Merida hybrid bicycle. They were in great condition and perfectly suited for this particular bike tour. 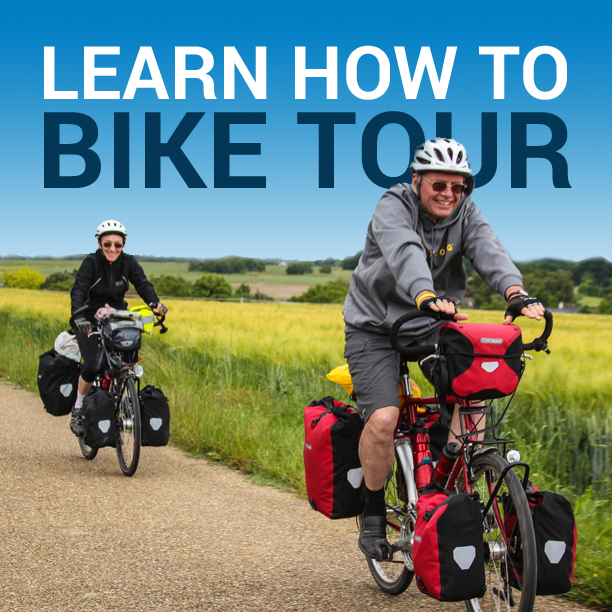 I’ve done other guided and self-guided bike tours in the past… and when you use someone else’s bicycle you never really know what you are going to get. But I was very happy with the bikes on offer from Berg Fritid. Should you decide to participate in this bike tour, I think you’ll be happy with the bikes as well.